For some kids, an early morning trip to the farmer's market might not be the ideal way to spend a Saturday, especially when bikes, baseball, or the park are the alternatives. However, spending a day together as family, enjoying the great outdoors, supporting your local community and purchasing fresh, whole foods and other goodies is always better than staying at home. You can get your children just as excited about a trip to the farmer's market as a trip the park by following my favorite seven ways to get kids involved. My favorite way to get my son excited about the farmer’s market is to remind him of the fantastic food that we will discover, and eat near the water. Any reason for my son to be near the water is a good reason in his mind. We pack up a blanket, silverware, a couple of cups and plates, reusable napkins and throw them into a tote. After we have decided exactly what we want to enjoy for brunch — usually, fresh bread, cheese and a cinnamon roll or two, we stroll over to the water and find a shady place to sit, enjoying a lovely meal as we watch the boats sail by. Children love their pets, but even more, kids love showing off their pets. The farmer’s market is the perfect place for your family to spend quality time with Fido, while showing him off to everyone you met. 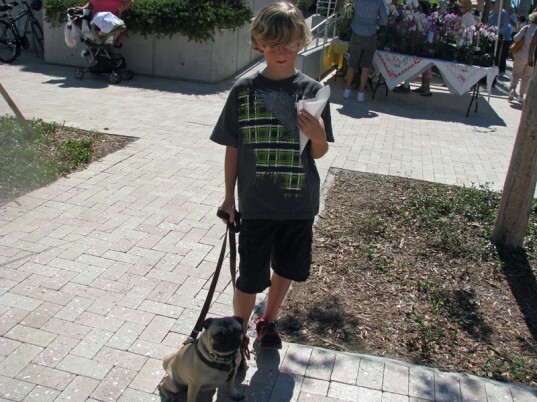 My son loves to take our English Bulldog or Pug to the farmer’s market, as long as he is in control of the leash. People will ooo and ahhh over our pets and ask him questions about them. He loves the extra attention, and the opportunity to tell others about his pets. Just be sure to you accompany your child at all times when they are walking your pet at the farmer’s market to monitor who is talking to your child and about what. Give your child a “special” reusable bag that is completely his own. Advise him that he is responsible for holding it, keeping track of it, and packing and carrying all of his farmer’s market finds in it. 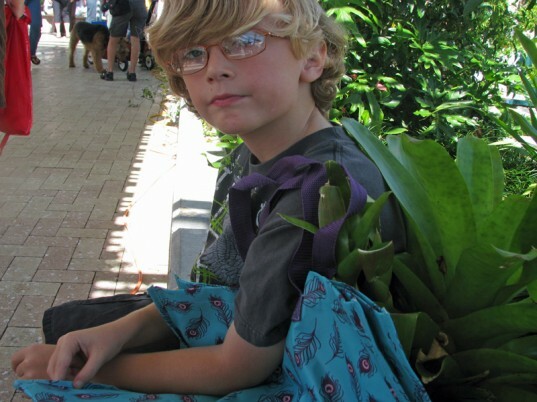 My son enjoys this part of our farmer’s market excursions because he feels like he is in control of the “grocery shopping.” He also likes to collect leaves, pine cones, seashells and other lovely pieces of the outdoors to bring home to add to his collections — a reusable bag is the perfect catch-all. 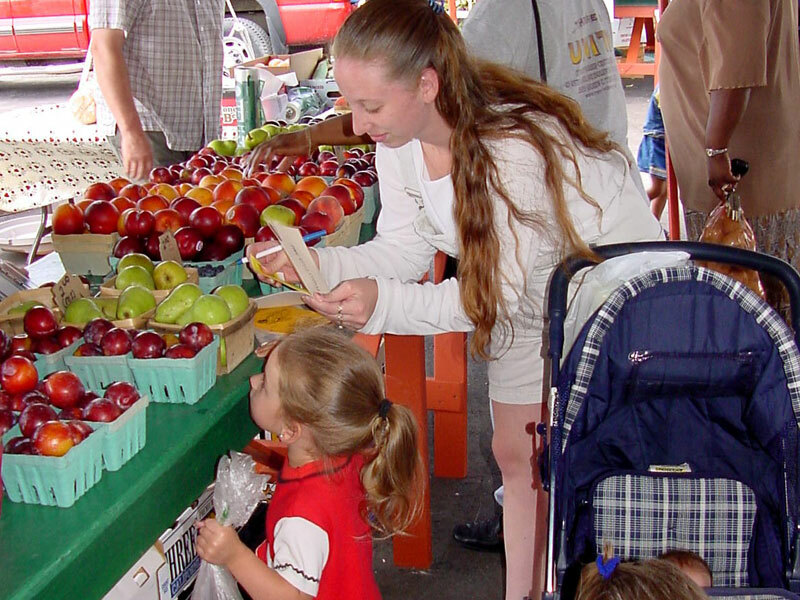 Many places around the country have farmer’s markets that sell goods made by children. If your child loves to bake, grow veggies, sew, craft or play a musical instrument, you can sign them up for their own booth at the children’s farmers market. This will give your child the opportunity to sell their goods, work with and make money, interact with customers and have a huge feeling of pride and satisfaction from selling something that they created. 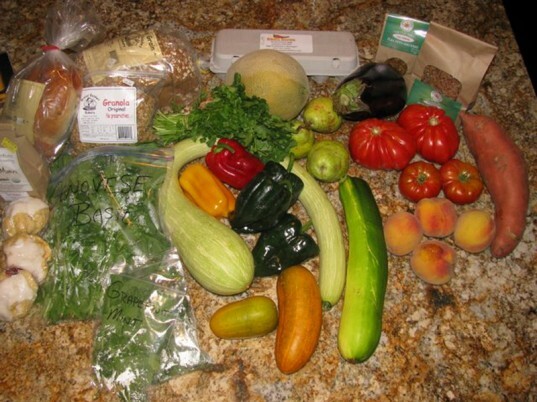 Before we leave for the farmer’s market, I love to engage my child by asking him what he would like to have for dinner that evening. Once he picks a main course, we sit down and make a list of the ingredients that we will need to buy at the farmer’s market. He then clips the list to his clipboard and tosses it along with a pen in his reusable bag. While we are marketing, he will check off the ingredients that we purchased and make sure that we have everything that we need for the meal. Later that day, we prepare the meal of his choosing with the fresh, whole ingredients that we purchased together. 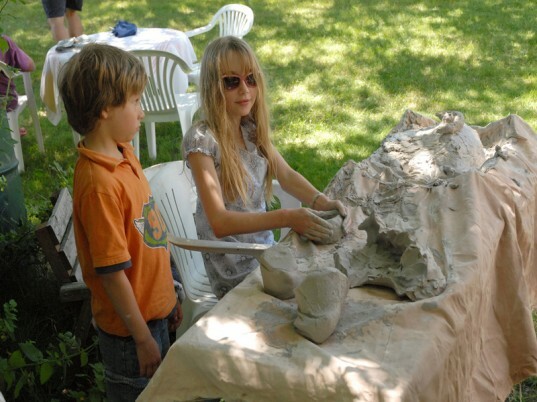 Many farmer’s markets have activities planned for the children to participate in during the day including arts and crafts or a play area. Our farmer’s market has a large green area in the middle that always has stacks of hula hoops — and really who can resist a hula hoop? There’s usually live music and other children dancing or playing in the green area. Regardless of the day, there are always enough children playing for my son to stop in for a quick pick-up baseball game, hula hoop contest or a chat with someone his age for a few minutes. 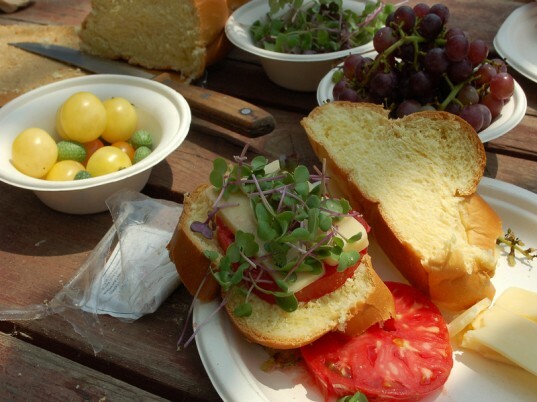 My favorite way to get my son excited about the farmer's market is to remind him of the fantastic food that we will discover, and eat near the water. Any reason for my son to be near the water is a good reason in his mind. We pack up a blanket, silverware, a couple of cups and plates, reusable napkins and throw them into a tote. After we have decided exactly what we want to enjoy for brunch -- usually, fresh bread, cheese and a cinnamon roll or two, we stroll over to the water and find a shady place to sit, enjoying a lovely meal as we watch the boats sail by. Children love their pets, but even more, kids love showing off their pets. The farmer's market is the perfect place for your family to spend quality time with Fido, while showing him off to everyone you met. My son loves to take our English Bulldog or Pug to the farmer's market, as long as he is in control of the leash. People will ooo and ahhh over our pets and ask him questions about them. He loves the extra attention, and the opportunity to tell others about his pets. Just be sure to you accompany your child at all times when they are walking your pet at the farmer's market to monitor who is talking to your child and about what. Give your child a "special" reusable bag that is completely his own. Advise him that he is responsible for holding it, keeping track of it, and packing and carrying all of his farmer's market finds in it. My son enjoys this part of our farmer's market excursions because he feels like he is in control of the "grocery shopping." He also likes to collect leaves, pine cones, seashells and other lovely pieces of the outdoors to bring home to add to his collections -- a reusable bag is the perfect catch-all. Hand's down, one of the best things about the farmer's market is the samples. There are so many vendors there and almost all of them have a sample of their food for you to try. I encourage my son to try different foods at all of the booths -- this is a great way to introduce your child to new foods without having to actually buy them, only to find out that your child doesn't like it. It's also a great way to work on your child's manners -- 50 booths, 50 times to work on saying "please" and "thank you." 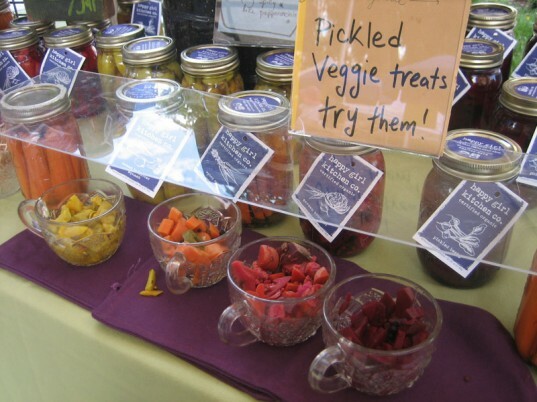 Many places around the country have farmer's markets that sell goods made by children. If your child loves to bake, grow veggies, sew, craft or play a musical instrument, you can sign them up for their own booth at the children's farmers market. This will give your child the opportunity to sell their goods, work with and make money, interact with customers and have a huge feeling of pride and satisfaction from selling something that they created. Before we leave for the farmer's market, I love to engage my child by asking him what he would like to have for dinner that evening. Once he picks a main course, we sit down and make a list of the ingredients that we will need to buy at the farmer's market. He then clips the list to his clipboard and tosses it along with a pen in his reusable bag. While we are marketing, he will check off the ingredients that we purchased and make sure that we have everything that we need for the meal. Later that day, we prepare the meal of his choosing with the fresh, whole ingredients that we purchased together. 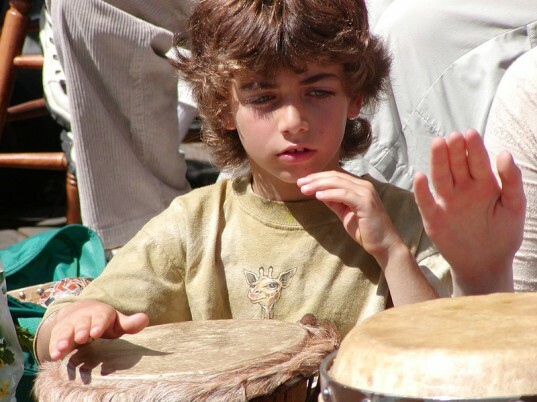 Many farmer's markets have activities planned for the children to participate in during the day including arts and crafts or a play area. Our farmer's market has a large green area in the middle that always has stacks of hula hoops -- and really who can resist a hula hoop? There's usually live music and other children dancing or playing in the green area. Regardless of the day, there are always enough children playing for my son to stop in for a quick pick-up baseball game, hula hoop contest or a chat with someone his age for a few minutes.